Rabbi and scholar of the seventeenth and eighteenth centuries; lived in Pinczow, and later in Plotzk. He was the author of the following works: "Ya'alat Ḥen" (Zolkiev, 1802), sermons on different parashiyyot; "Geṭ Meḳushshar" (Warsaw, 1812), compendium to that part of Maimonides' "Yad" which treats of divorce; "Magen ha-Elef," called also "Shem Ḥadash" (ib. 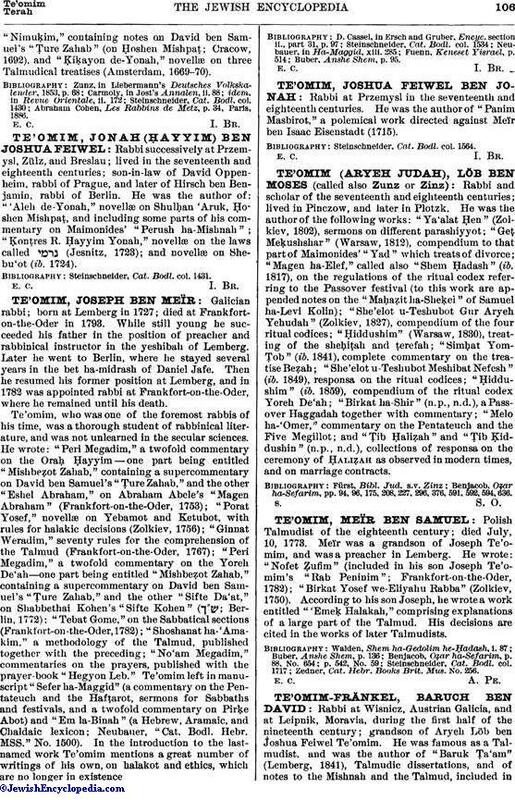 1817), on the regulations of the ritual codex referring to the Passover festival (to this work are appended notes on the "Maḥaẓit ha-Sheḳel" of Samuel ha-Levi Kolin); "She'elot u-Teshubot Gur Aryeh Yehudah" (Zolkiev, 1827), compendium of the four ritual codices; "Ḥiddushim" (Warsaw, 1830), treating of the sheḥiṭah and ṭerefah; "Simḥat Yom-Ṭob" (ib. 1841), complete commentary on the treatise Beẓah; "She'elot u-Teshubot Meshibat Nefesh" (ib. 1849), responsa on the ritual codices; "Ḥiddushim" (ib. 1859), compendium of the ritual codex Yoreh De'ah; "Birkat ha-Shir" (n. p., n. d.), a Passover Haggadah together with commentary; "Melo ha-'Omer," commentary on the Pentateuch and the Five Megillot; and "Ṭib Ḥaliẓah" and "Ṭib Ḳiddushin" (n. p., n. d.), collections of responsa on the ceremony of Ḥaliẓah as observed in modern times, and on marriage contracts. Benjacob, Oẓar ha-Sefarim, pp. 94, 96, 175, 208, 227, 296, 376, 591, 592, 594, 636.